Enjoy the snow at Mt. Fuji during the day and a glittering illumination event in the evening on this 10.5 hour fun-filled day trip from Tokyo. Start the trip with a hearty all-you-can-eat Korean BBQ before burning up your energy at Mt. 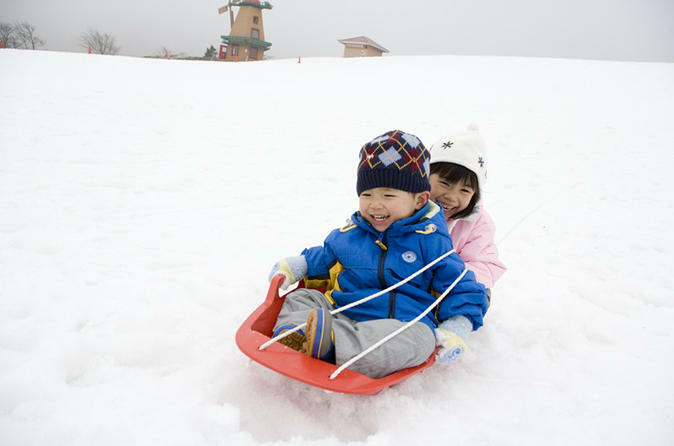 Fuji 2nd Station's Grinpa theme park playing in the snow. Head over to a local sake brewery for sake tasting and shopping and then onto the evening's main event, the 'Sagamiko Illumillion' festival, before returning to Tokyo. The bus will leave Shinjuku Washington Hotel at 9:50 heading towards Gotemba, a city at the foot of Mt. Fuji perhaps best known for its Gotemba Premium Outlets shopping center. Rather than shopping, you will head straight to a Korean BBQ restaurant for an all-you-can-eat buffet-style lunch. Around 55 dishes will be available including various meat (beef, pork and chicken), vegetables, salad, rice, kimchee and dessert. Fill yourselves up as much as you can for 70 minutes to set you up for the day’s activities. After lunch, the tour will reach Grinpa, a theme park located at Mt. Fuji 2nd Station featuring an outdoor snow area. For 70-90 minutes, enjoy having a snowball fight, making a snowman or zipping down the slopes on free rental sleds, so make sure to wear waterproofs or bring a change of clothes! A limited stock of rental wears are available for an additional charge (JPY3,000 for adults and JPY2,000 for children between 100-140cm. Boot rental costs JPY1,000) while gloves are available for sale. Please note that this tour does not involve skiing or snowboarding. Time for a change of pace as the tour pops into Sasaichi Shuzo Brewery for a spot of sake shopping and tasting for half an hour. Founded in 1919, this brewery uses the pure water from the Misaki Mountains to create its unique products. The final activity is to view the Sagamiko Illumillion light-up event held at Sagamiko Resort Pleasure Forest, the biggest illumination event in Kanto using over 6 million LED lights to color the landscape. With the site divided into numerous sections focusing on distinctive themes, get lost in the world of bright lights and dazzling displays for an hour. With the tour wrapping up at this point, it’s time to get back on the bus and return to Shinjuku at the estimated time of 20:30.